A diet low in calcium and Vitamin D? Are you Asian or Caucasian? Have you or a member of your family broken a bone as an adult? Have you had an early menopause? Have you been taking high doses of thyroid medication or high doses for more than 3 months of cortisone-type drugs? Do you smoke or drink alcohol to excess? If you answered “YES” to any of the above questions, review the four steps for healthy bones. A normal, healthy bone structure is slightly porous with healthy tissue. This allows it to resist bone fractures, typically of the wrist, hip, and spine, which affects millions in the United States, with a majority of these occurring in people over the age 65. Magnesium is also essential for bone health, as a majority of it is contained in our bones and teeth. It plays an important role in enzymatic reactions (including energy and cardiovascular function), muscle relaxation (calcium stimulates muscle contraction), and heart health by reducing artery spasms. As a component of chlorophyll in plants, dark green vegetables are a good food source, as well as nuts, seeds, legumes, soy products, avocadoes, and dried apricots. However, some methods of food preparation (such as soaking and boiling) will cause the food to loose the magnesium. Adults should moderately engage in such activity at least 30 minutes each day, and children should moderately engage in at least 60 minutes per day. Calcium bioavailability found in eco-friendly, above sea fossilized Caribbean coral. 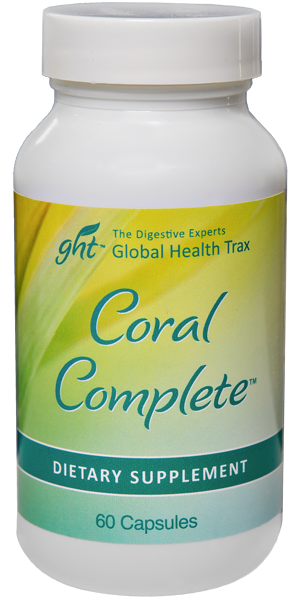 Vitamins and Minerals — Coral Complete provides you with a boost of Vitamin C and D. It also delivers naturally occurring trace minerals from the coral, which further supports healthy bone. Other Important Ingredients: Malic Acid and Betaine Hydrochloride (HCI), serve as digestive aids that assist in releasing acid into the digestive tract, supporting digestion and the absorption of this crucial mineral, calcium. Coral Complete can be taken at any time of day, but for optimum results, evening use is preferred. 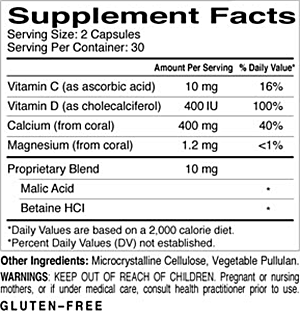 Take two Coral Complete capsules with an evening meal or at bedtime.